Remember the OSPF NSSA Forwarding Address kludge and its consequences? Let’s figure out whether the nerd knobs available in Cisco IOS can save the day. TL&DR: Don’t use OSPF areas if you can avoid them. Don’t use NSSA areas. So let's conclude the saga with a MacGyver fix – a series of nerd knobs that have to be adjusted to make the network work. If this won't persuade you to stay away from NSSA areas nothing will. If you want to replicate the results published in this blog post use this VIRL topology file from my VIRL topologies GitHub repository. Type escape sequence to abort. After we shut down the loopback interface on E1 (to emulate a broken design with no loopback interface on ASBR), C1 loses one of the paths to E1 but can still reach it. For detailed explanation of this behavior read the previous blog posts mentioned above. Cisco IOS OSPF implementation has way too many nerd knobs, some of them violating OSPF standards to make your network work. We’ll use two of them here. The area nssa translate type7 suppress-fa knob disables the Forwarding Address propagation from type-7 to type-5 LSA. The backbone type-5 LSA is originated without the forwarding address (making it look like the external subnet is attached directly to ABR) and with no OSPF cost adjustment. From the SPF perspective, the cost to traverse the NSSA area is zero. After configuring this feature on A1 and A2 the type-5 LSA observed on C1 has the same OSPF cost as before (E1 cost 30) but no forwarding address. Change in forwarding address fixes the network. C1 can see a path to 192.168.1.0/24 going through A1 (10.0.0.9) – remember that the A2-E1 link is still broken. It can also reach 192.168.1.1 (a major improvement). However, once we fix the A2-E1 link C1 still sees only a single path to C1, this time through 10.0.0.13 (A2). 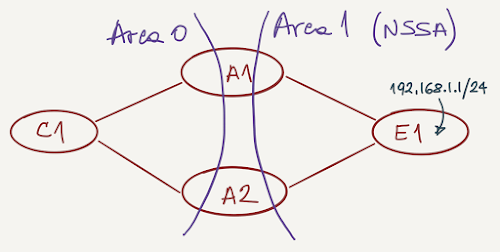 The reason for that unexpected behavior is quite simple: due to NSSA rules a single ABR translates the type-7 LSA into type-5 LSA, and as we no longer have the forwarding address in type-5 LSA, routers in other OSPF areas don’t know there are two equal-cost paths to E1. When inspecting the type-5 LSAs in the backbone area you can see that the type-5 LSA for 192.168.1.0/24 is no longer originated by 192.168.0.1 (A1) but by 192.168.0.4 (A2). To fix that side effect we need yet another nerd knob: always translate type-7 LSAs into type-5 LSAs: area 1 nssa translate type7 suppress-fa always. Not surprisingly, C1 has two equal-cost paths to 192.168.1.0. You might fix networks using OSPF NSSA areas with nerd knobs that violate OSPF standards. They might come handy if you have to fix an existing network, but just because they are there you SHOULD NOT use them when designing a network. Try to stay away from OSPF areas, and don’t use NSSA areas – even though OSPF looks like a Swiss Army Knife, there are better tools to get the job done. "Don’t use OSPF areas if you can avoid them. Don’t use NSSA areas". As usual, it depends. If you make a good design I do not see big problems. Telecom Italia IP networks, which is definitely not a small network (500+ P+PE routers) has an OSPF multiarea architecture with 66 NSSA areas. It has been working great for more than 15 years without any (OSPF) problems. Lesson to be learned (IMHO): always use the KISS principle. I've heard of SP networks running over a 1000 routers in a single area (not sure whether it was IS-IS or OSPF). Probably impossible to implement 15 years ago, but definitely running production today. Anyway, after realizing how complex NSSA areas are, I'm not touching them again. First I would like to thank you for all the great blog posts you are constantly producing. I find them as great source of knowledge and great place to find the perspective of a notorious engineer. 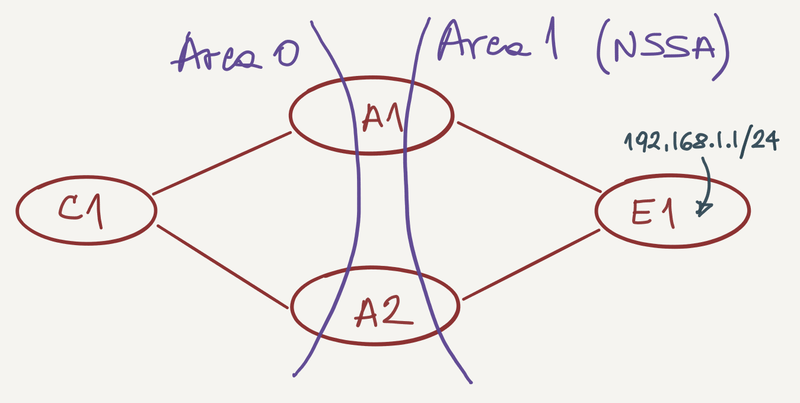 What are the biggest signs that your OSPF flat Area 0 is getting to large, how we can adequately judge it? Is there a moment where you can certainly would say - "enough is enough" and I mean before the big meltdown, which inevitably will happen, it is just a matter of the right consequence of the right events? Different people, vendors, books says differently. I know 5-10-15 years ago was different than today, given the fact of the bare CPU and RAM power of nowadays devices, but anyway, what is your vision on this topic? It obviously depends on the weakest link (the slowest router in your network) and that could be anything. However, assuming all your gear is no older than a few years, I know people running several hundred routers in a single OSPF area. Anyway, do some link flaps (which will trigger Type-1 LSA flooding, which will trigger full SPF run) and see what CPU utilization you get.